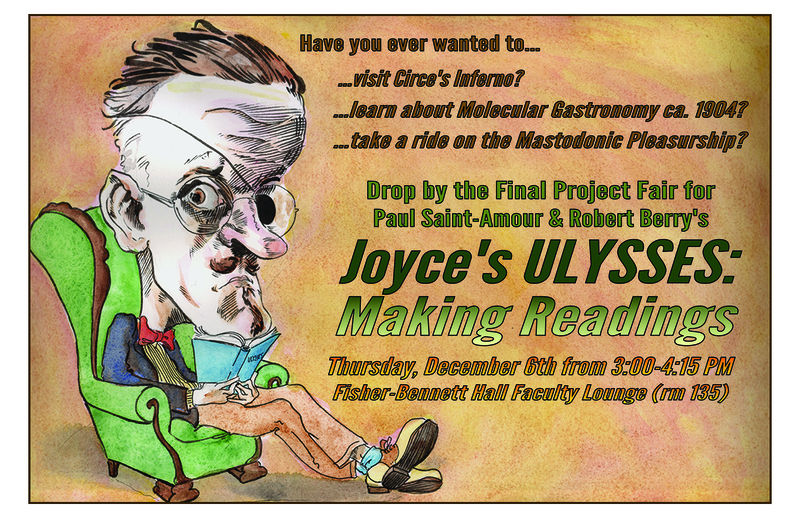 “Joyce’s Ulysses: Making Readings” is a Critical-Creative Approaches course. We’ll devote the first ten weeks of the semester to reading Joyce’s novel alongside selected criticism and adaptations in a variety of media. Classroom discussion, mini-lectures, and student glosses will form the basis of this part of the course. We’ll spend the final month of the course collaboratively making readings of Ulysses—conceiving and producing hybrid creative-critical projects that engage with the novel in some way other than conventional analysis. You might co-write an apocryphal episode, complete with schema and annotations. You might produce a film or stage adaptation of an episode that benefits from your readings in Joyce criticism. Or you might devise some other approach entirely. (Go here to see online projects from a past iteration of the course, as well as some press about it.) Our co-instructor and primary consultant on the final projects will be Rob Berry, the artist behind Ulysses Seen, the internationally acclaimed digital comics adaptation of Joyce’s novel.